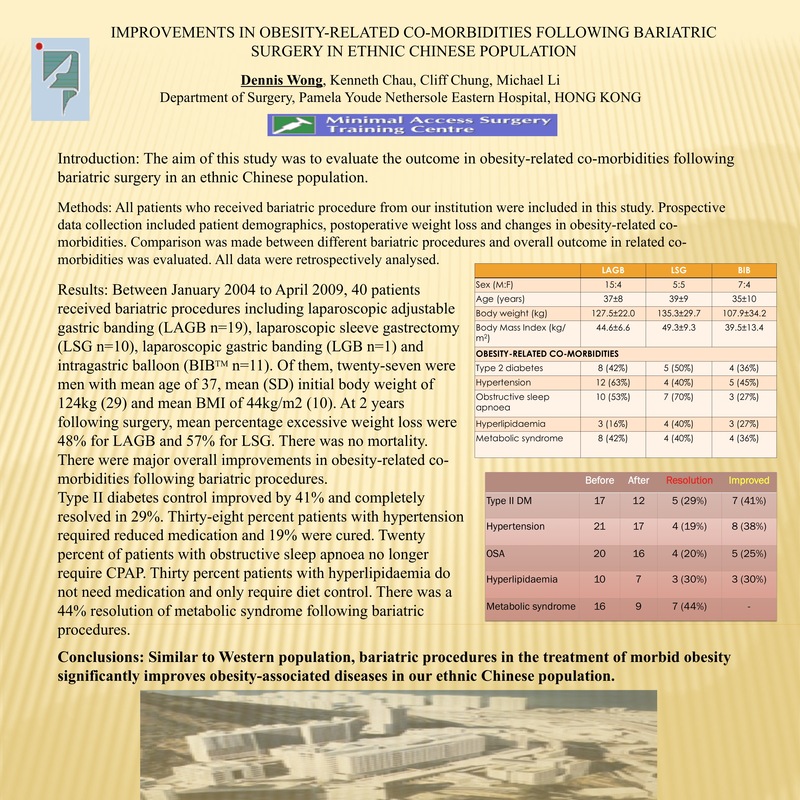 Introduction: The aim of this study was to evaluate the outcome in obesity-related co-morbidities following bariatric surgery in an ethnic Chinese population. Methods: All patients who received bariatric procedures from our institution were included in this study. Prospective data collection included patient demographics, postoperative weight loss and changes in obesity-related co-morbidities. Comparison was made between different bariatric procedures and overall outcome in related co-morbidities was evaluated. All data were retrospectively analyzed. Results: Between January 2004 to April 2009, 40 patients received bariatric procedure including laparoscopic adjustable gastric banding (LAGB n=19), laparoscopic sleeve gastrectomy (LSG n=10), laparoscopic gastric bypass (LGB n=1) and intragastric balloon (BIB n=11). Of them, twenty-seven were men with mean age of 37, mean (SD) initial body weight of 124kg (29) and mean BMI of 44kg/m2 (10). At 2 years following surgery, mean percentage excessive weight loss were 48% for LAGB and 57% for LSG. There was no mortality. There were major overall improvements in obesity-related co-morbidities following bariatric procedures. Type II diabetes control improved by 41% and completely resolved in 29%. Thirty-eight percent patients with hypertension required reduced medication and 19% were cured. Twenty percent of patients with obstructive sleep apnoea no longer required CPAP. Thirty percent patients with hyperlipidaemia do not need medication and only require diet control. There was a 44% resolution of metabolic syndrome following bariatric procedures. Conclusions: Similar to western population, bariatric procedures in the treatment of morbid obesity significantly improves obesity-associated diseases in our ethnic Chinese population.